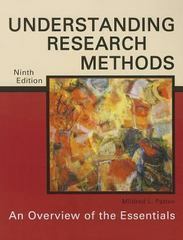 Understanding Research Methods 9 Edition A perennial best-seller since 1997, this updated text provides a detailed overview of all the important concepts traditionally covered in a research methods class. The numerous examples and large number of exercises help students master the material. Divided into short sections, this text makes it easy for you to give customized assignments. New to this edition: Five new sections on in-text citations and reference lists have been added. Numerous changes have been made for consistency with the new edition of the APA and ASA manuals, and new examples have been added.